The birth of the real factorial function. Interpolating the natural factorial n! The following exposition relies on "Why is the gamma function so as it is?" by Detlef Gronau, Teaching Mathematics and Computer Science, 1/1 (2003), 43-53. Note: The following formulas are reconstructions in modern parlance. The notations used are different from those in the original papers! (5) 1826, A. M. Legendre, Traité des fonctions elliptiques et des integrals Eulériennes: Same as Euler's 1768 definition. (1) The interest of Christian Goldbach in the problem of interpolating the natural factorial n! to real (positive) values was a driving force in the course which gave birth to the gamma function. 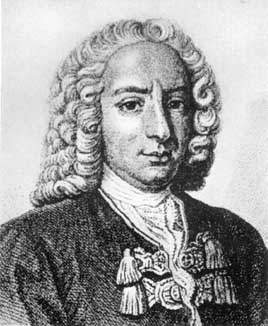 (2) The first known representation of an interpolating function of the factorial was given by Daniel Bernoulli, not Leonhard Euler. (3) The first definition of Euler (1729) bears the name of Gauss, obviously erroneously. (4) The definition of Daniel Bernoulli converges faster to the limit than that of Euler. (5) Euler changed his definition between 1729/30 and 1768. The change is equivalent to a move from x! to Gamma(x). (6) Legendre took on the 1768 definition of Euler, but he did not introduce the transition from x! to Gamma(x). 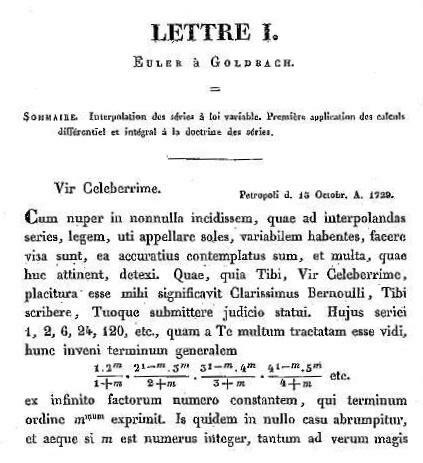 Daniel Bernoulli's letter to Goldbach from 1729-10-06 giving the first representation of an interpolating function of the factorials in form of an infinite product, later known as the gamma function. Published by Paul Heinrich Fuss, Correspondance mathématique et physique de quelques célèbres géomètres du XVIIIeme siècle .., St. Pétersbourg, 1843, Tome II, page 324-325. Scan by Bruce Arnold, released into the public domain. See also this discussion on MathOverflow. In a comment Jonas Meyer asked: "I'm still curious (...): If this correspondence was well documented by Fuss in the 19th century, why did so many 20th century scholars fail to acknowledge Bernoulli's contribution? " makes a serious error in not mentioning Daniel Bernoulli's letter and solution. I just looked it up again: Davis gives only Tome I of Fuss's 'Correspondance' as reference, whereas Daniel's letter is in Tome II. Perhaps Davis missed this important source. Later his mistake was passed down by 'argumentum ad verecundiam' (which is the Latin translation of 'according to Wikipedia'. :)"
Some links compiled by Raymond Manzoni in the thread "Gamma function question" on sci.math. .